This is really amazing - a work of art. Congrats to all involved - I really hope to be #36 up there some day! Wow! that is beautiful. I know some of those guys. I had been ignoring these formation pics with a "seen it, show me some cool paint jobs" but in viewing this photo I was struck with the amazing precision they have achieved with this huge formation. Wow ! I am guessing that few other homebuilts would be capable of such precision flying. RV-8A: Flipped fuselage, working on wiring. Well, the planning, practice, and execution of the 35-ship formation to honor Van's 35 anniversary of being at OSH is now history. Could not have happened without 35 pilots from the 4 corners of the country willing to take leave, use personal funds, submit to the discipline of formation flying, and work very hard at flying in a stressful environment. They did a great job. Here are their names by the designated 4-ship flight order. 35 RVs arrive at SQI for practice, 5 maintenance problems fixed, 35 planes takeoff Sunday afternoon and land as 4-ship echelons at OSH, 1 maintenance problem fixed, 35 RVs fly first performance, 2 maintenance problem solved, 35 RVs fly second performance. Some had doubts it could be done. Teamwork made it happen. Congratulations and my compliments to all. The picture says it all, but, there is no doubt that that 35 ship formation was the best large formation ever flown at Oshkosh. My congratulations to all involved! 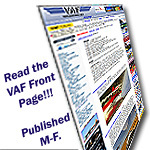 ...on the front page of www.vansaircraft.com. This is a new one (properly re-sized to 1024x768). It was extremely gratifying to bring together all these pilots with varying skill, practice and focus on the end game, work as a team, and pull this off. It was an amazing feat and I was proud to be a part of it and humbled by the character of the pilots involved. Special thanks to Stu McCurdy for organizing this. Could not have been done with out his leadership and focus. I still cant believe how well the formations were executed. The pictures say it all. That does not happen by accident I assure you. Lots of practice and laser focus on the end game. What a tribute to Vans and these pilots listed above. It was an honor to be part of the Oshkosh Formation Team this year. Special thanks to Falcon and Kahuna. Their planning, leadership and execution were flawless which led to a very successful tribute to Van. The pictures tell the tale, they are amazing! I too am proud to have been a part of this effort. Without Stu and Kahuna it would not have happened. Hard work and lots of practice did pay off at OSH. Van also came over and talked to us and has a photo op with us all before the flight Tuesday and that was great to get to meet and talk to him. Thanks to all the pilots for their hard and safe work to make this happen. I can't envision what 40 will look like but I'm sure Stu and Kahuna will make it happen.